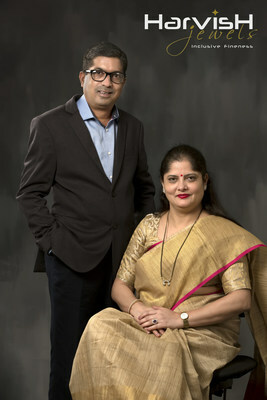 From designing jewellery to establishing Harvish Jewels, Vaishali and Harshad Soni have had many feathers in their hat. Behind all these also lays bare a historic journey as the directors of one of the most sought after jewellery studio in the cultural capital of Gujarat, while also throwing light on the various nuances of jewellery, latest jewellery innovations, facets of services of their own brand along with the time-tested tips to follow for a successful life. Led by the passion of its founders whose fondness for Modern Art & Tradition gave birth to Harvish Jewels - the finest reflection of Vadodara's unmatched Jewellery traditions and workmanship, Harvish Jewels is a premium jewellery studio that aspires to create unique, elegant Jewellery designs with a touch of tradition. More than just being a premium brand,Harvish Jewels is a destination in itself, acknowledged for its exemplary artistic designs, wide collection of jewellery, impeccable service and unconventional approach. This is what sets apart,Harvish Jewels from any of it counterparts giving it a leading edge and preference from its customers. For the love of the City, Art & Tradition attached to it, Vaishali & Harshad Soni have been constantly striving for the last 30 years to revive and preserve this art by providing the traditional essence in all their designs to build up a legacy which is bound to give a serious artistic approach. The couple themselves is visionary and pioneer in the field of Gold, Diamonds, Gems and Colour Stones. They also hold a rich lineage of being associated with the one of the most eminent jeweller family, known to be the pioneer jewellers in the princely state of Baroda (now Vadodara). The studio under the valuable guidance and able leadership of Vaishali and Harshad Soni constantly strives to engineer craftsmanship by redefining the art of jewellery. For the last 28 years, they have been actively involved with sourcing, trading and manufacturing of gold, gemstones, diamond jewellery from Vadodara including Mumbai and other parts of India. The jewellery is manufactured using hi-tech equipments and undergoes stringent quality checks and parameters in line with the global standards. The best part is that customers get to see a lot of traditional gold, gemstones and diamond designs on display curated by some of the best artisans from across the country. According to Vaishali Soni, "Every customer atHarvish Jewels is treated like a family member, who expects a long standing relationship combined with customer experience of lifetime. All these parameters will be instrumental ahead in building strong and lasting relationship between our brand and all its customers." According to Harshad Soni, "Jewellery is an art of constructive crafting of your ideas, imaginations and desires into solid articles. Appraising the expectations of our customers, we atHarvish Jewels will not only focus on creation of value for money ornaments which will focus specifically on value for thoughts, creativity and expectations." They together now present to Generations Next, one of India's most trusted Jewellery house - Harvish Jewels - A venture by Vaishali and Harshad Soni. As a Jewellery store, 'Harvish Jewels' has established a strong stamp of recognition, quality and credible reputation and their customers continue to be loyal to the brand. The heritage ofHarvish Jewels patron also narrates the tales of prestigious clientele (National & International) from all walks of life. Driven by passion and deep love for jewellery, the couple travels extensively across the globe in their quest to be abreast with latest international trends and as they strategically drive their footprints ofHarvish Jewels in world markets. As the couple explores the world through their frequent travels, they draw their inspiration from their journeys to blend traditional Indian style with contemporary style trends. Harvish Jewels was also one among the few Jewellery houses to introduce certified diamonds to their clientele. In heritage Indian Jewellery, the lineage ofHarvish Jewels is unparalleled for their exquisite collection. Renowned for Diamonds, Colour Gemstones, Gold, Polki, Kundan Jewellery and one of the early pioneers of colour diamonds, and their repertoire is also one of the best in the country. Their mantra in life is 'to always stay on top of the curve'. Punctual by nature, they devote painstaking attention to build strong rapport with clients. 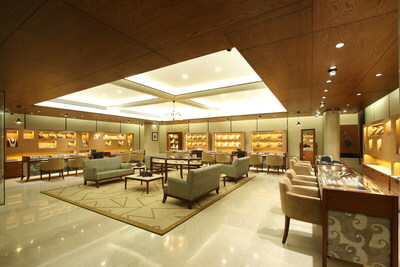 Warmth and hospitality with personalized attention is an integral part of guest experience atHarvish Jewels. Vaishali and Harshad Soni's vision is to expand the eponymous label in accordance with his ancestors design philosophy to international markets and continue to innovate and strive for new benchmarks in quality, creativity, and design. Harvish Jewelsis premium jewellery studio that aspires to create unique, elegant gold jewellery designs with a touch of tradition. Exquisite Jewels from the house ofHarvish Jewels shaped in elegant constituents, personify the heritage of Vadodara with a modern eclectic twist. Their taste for high quality, orientation towards customer service and affinity towards affordable prices ensure that their jewellery will be cherished by customers on all special occasions.